There are some applications for the Raspberry Pi that were a very long way from our minds back in 2009, when we were trying to come up with a computer to get kids programming again. I think it’s fair to say that we did not think we were building a personal seismograph. Raspberry Shake has blown past its Kickstarter target of $7,000 to raise ten times that amount, and it’s still got a couple of days to go. It will also record earthquakes of larger magnitudes farther away but it will miss some of the subtleties. Raspberry Shake can detect and record short period (0.5 – 15 Hz) earthquakes; the farther away an earthquake, the less of that range of frequencies can be recorded. In order to get data coming from the ground we need a sensor able to detect these data. A geophone is a ground motion transducer that convert ground movement into voltage. Raspberry Shake use a geophone and in this video we are going to show you what’s inside of it. 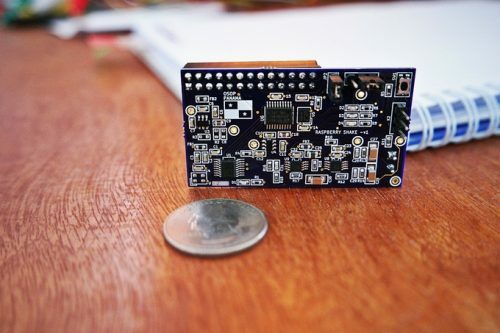 The little add-on board amplifies and digitises the signal from the geophone, and feeds it to your Raspberry Pi. The Raspberry Pi time-stamps the data and stores it in a seismic industry standard format and sends it in answer to client requests. Those requests are displayed on your smartphone or computer monitor. The complete system is called a seismograph. Angel and the other instrument builders behind the Raspberry Shake make seismographs and other equipment for a living. This device is the little brother of a seismograph his team makes for universities and other earthquake observers. It runs the same open-source software that the United States Geological Survey (USGS) uses. Don’t be fooled by the size and the price. Raspberry Shake is better than many of short-period seismometers in current use by the local networks of the USGS and many developing countries. Several software vendors have, for the first time, provided personal no-cost licenses for this project. Raspberry Shake will make observatory quality data that can be shared in the worldwide standard SEED format. 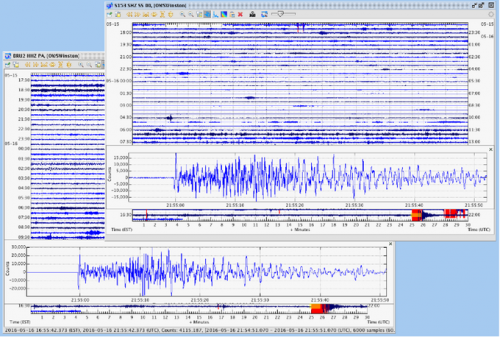 All modern automated seismology programs used by observatories can use the data from the Raspberry Shake. It’s the Volkswagen of seismometers – yes there are Lamborgini seismographs but both the Lamborghini and the Volkswagen will get you from point A to point B. To prove it, here’s some data from a Raspberry Shake ($99 if you back the Kickstarter now) against data from a $50,000 professional seismograph. In this image the Raspberry Shake’s data is displayed at the top. Both devices are showing data from the same regional earthquake. Bringing the affordability of a piece of kit like this down to consumer levels is a real achievement: previously this sort of equipment has only been available to universities, governments and other bodies with the ability to make very big investments. As you’ve probably gathered, we love it: head over to back Raspberry Shake on Kickstarter quickly, before the opportunity’s gone! I really love it, when there are projects like this in the Rapsberry Blog! Thank you, Liz. Please keep them coming. Especially when there is still time to back them it’s a good boost for Kickstarter projects. I really like this project and will get one for myself. We are so glad to see this amazing article about Raspberry Shake. Here at OSOP office we’re working on differents details in the last stage of our campaign in KS and for us it’s a motivation to keep forward. Thanks for spreading the word and being part of watch the earth move. You guys made my day. I have four Raspberry Pi that control things in my home brewery. This little Raspberry Shake is only little in size, t is better than many short period vertical seismometers used in observatories all over the world today. My promise to all of you is that I will be here help every single Shake owner to get their Shake up and running. This is more than a Kickstarter campaign with me, it is a passion! Hi Angel! Thanks for commenting – we’re really excited about the Raspberry Shake! VERY best of luck when you kick off manufacturing. $30 for postage to the UK put me off for the kit I was interested in. I feel the same way you do about the shipping. If could find a less expensive way to ship anything from Panama to the UK for less money believe me I would. An excellent idea! Ha! Where I live in NYC-USA, nestled between the tracks of two separate train lines (and a third being added by next year), poor thing wont have a rest for every 5 minutes a train is going by and I can feel my building shake from it! LOL! hello, check my Seismometer digital with Raspberry pi 3 w/ Arduino Uno Board.. Earlier this week, we talked about Raspberry Pi robots under the sofa.